Responding to the public outrage over images of a Federal Road Safety Corps, FRSC, commander cutting the hair of his junior female colleagues, the authorities of the federal agency has suspended the Rivers State commander, Mr. Andrew Kumapayi. Bisi Kazeem, spokesperson of the FRSC, on Tuesday, April 11, 2017, informed the press that Mr. Kumapayi has been suspended along with other officers who participated in the act of cutting off the hair of the female officers. 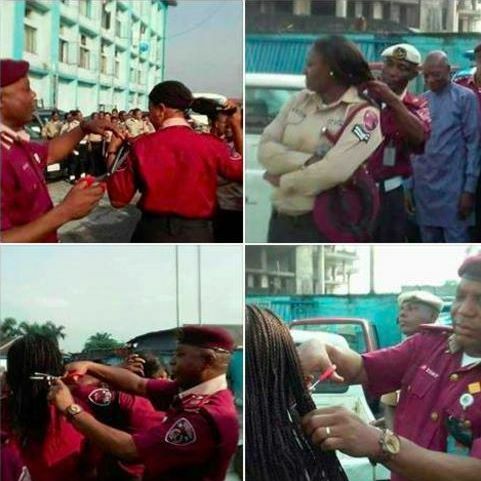 The photos, which emerged on Monday, April 10, 2017, show Andrew Kumapayi, the sector commander of the Rivers State Command of the FRSC, using a pair of scissors to crudely cut off the hair of some of his female corps members. The disturbing incident is said to have happened during the Monday morning parade. Kumapayi is said to have conducted an inspection of the “guard” and declared that their hairstyles “went beyond the women’s collars” as such violated an FRSC dress code rule. According to reports, the Rivers State FRSC commander also inspected the fingernails of the officers on the parade ground that morning. At the end of the exercise, the “offending” female officers were lined up and given the “punishment” of having their hair and weavons cut off. Boboye Oyeyemi, the corps marshal of the FRSC, has reportedly condemned the cutting off of the hair of female officers by his subordinate.